I just finished a bleach soak on all twelve of my hummingbird feeders and I've got dinner in the oven. 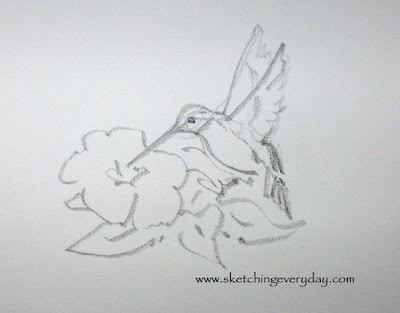 I just didn't have the energy to get out my watercolors and finish up yesterday's sketch, so here tonight is a two minute gesture drawing of a Lenox hummingbird figurine I own. Jerry got me a beautiful little tangerine and rose colored Hibiscus plant this spring that has been doing quite well on my studio porch. I noticed yesterday that it was not doing great in the heat, so I brought it inside and offered it plenty of water. It looks all perky now and is happily dominating my workspace. I have another giant pink one that I've had for years. I take it inside my studio in the winter. Looks like it'll have a new buddy this year. 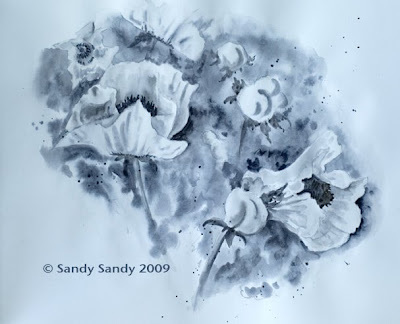 These flowers were drawn from life. I will finish it up with color tomorrow. 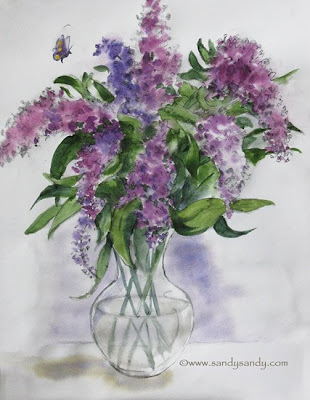 Here's today's sketch of the Butterfly Bush flowers that I posted yesterday. I decided to break out my watercolors and really try to bring these babies to life. 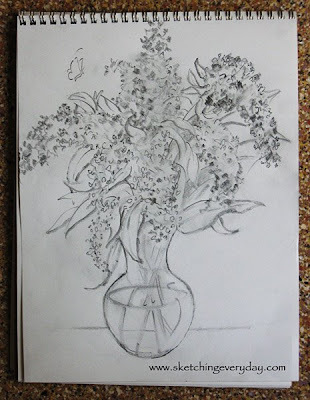 Here is my flower drawing (steps 1 & 2) for today's post. I'll finish it up tomorrow. This weekend I trimmed the bottom blooms off of our Butterfly Bushes. This will help prevent the resident cats from harming my hummingbirds. Sometimes the birds can be quite oblivious to danger as they furiously dart in and out of the maze of fragrant branches. Here's a bunch that I drew today. The drawing got a little out of control on the page. Next time I'll try to remember to start out smaller and leave more white space around what I'm depicting. 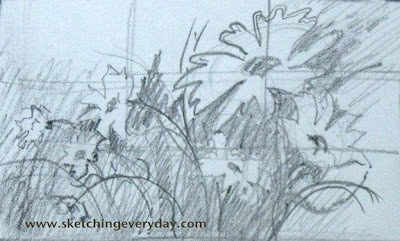 I'll admit, sketching everyday is sometimes hard to fit in and occasionally it feels like a chore. Once I get on with it however, I am glad I did. The discipline teaches me so much. I got a wonderful drawing in last night from Kay. 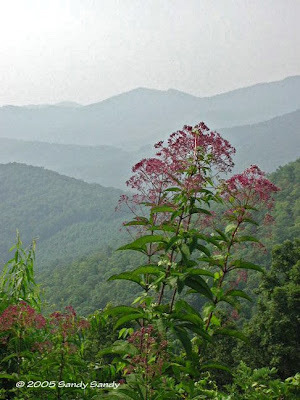 She writes;" I have recently found your blog, and love this idea. I am sorry to be late with my drawing, but here it is. 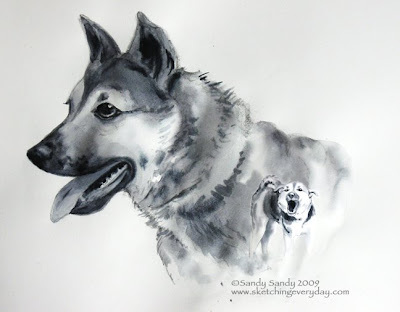 I enjoy very much trying to draw dogs!" Well Kay, actually, you are early! 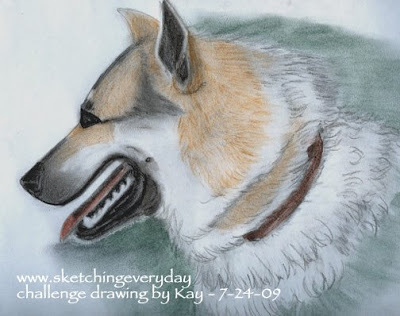 I usually don't post the current challenge drawing until Sunday or Monday. Feel free to send in any of the challenge drawings at any time. I always appreciate artist's efforts. Nice to meet you and thank you so much for your lovely colored pencil drawing, Kay! Also, here's my sketch (steps 1 & 2) today. I'll post the finish tomorrow. I plan on trying to combine this pose (via Photoshop) with the first one I did earlier this week. 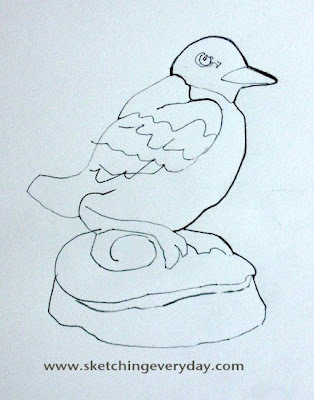 Here's my sketch for today, done from one of my handy bird carvings. Today I'm posting the next challenge photos of a pretty pup I met at the Burlington County Animal Shelter. 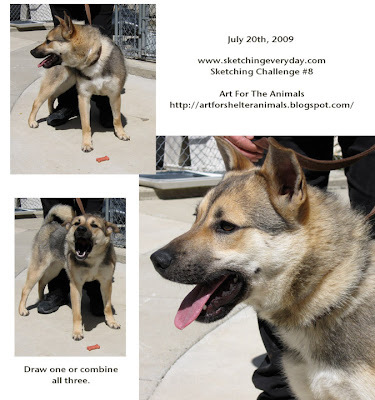 When I went there I took many reference photos of the animals for our Art For The Animals project. 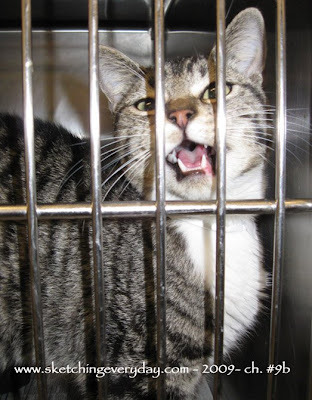 Right now I've got a call in to Lisa, the shelter manager. I haven't talked with her in over a month. It's time to touch base and see what our next move with the program will be. 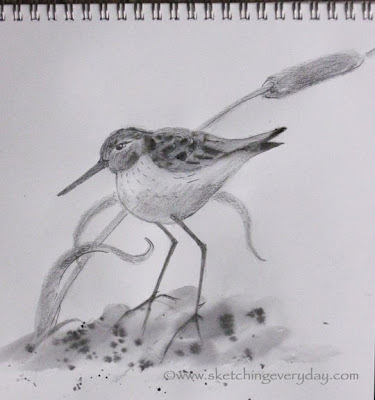 I did one sketch of this little cutie this morning. I hope some of you will use these photos to come up with your own composition. Use your artistic license with one, two or all of the shots in combination. See more posts about the project on my web log here. 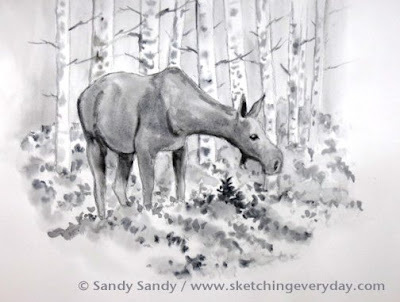 Today I was looking around the house for something to sketch when my old Sandstone Stallion caught my eye. 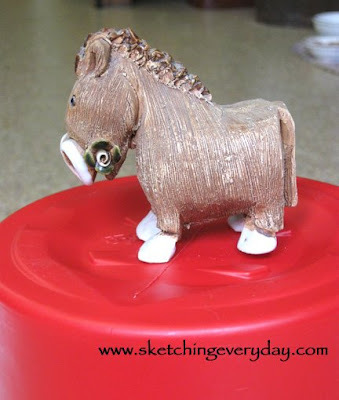 Here's a photo of him on top of a large coffee container I use to bring him up to eye level. 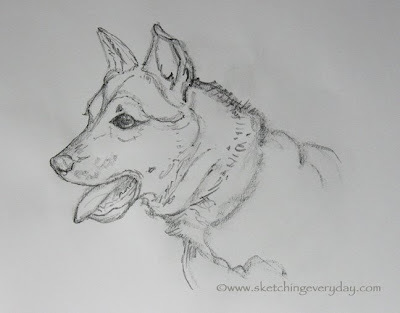 Today's post is four 2 minute gesture sketches I did of him. I turned him a quarter of a turn after each 2 minutes were up. New - Summer Special Offer! 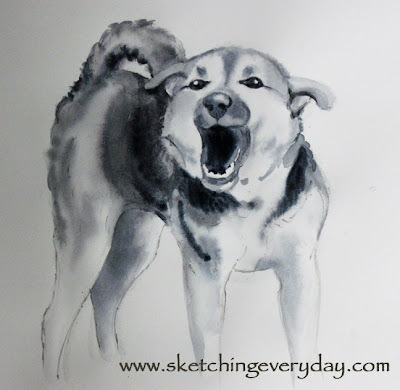 I'm offering a customized PRIVATE 4 hour watercolor and or drawing session at my studio for only $99.99. This offer expires 9/6/09. My normal fee is 3 hrs. for $99.99, so sign up this summer and get an hour free. Contact me to schedule or for more details. Thanks Judy for your much appreciated words of encouragement and your beautifully creative rendition! 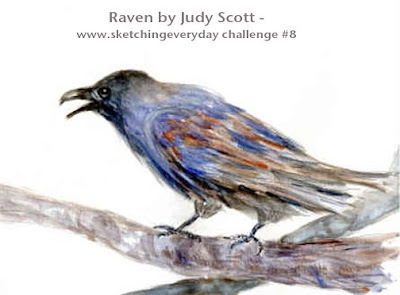 Raven has long been associated with magic and ancestor spirits. 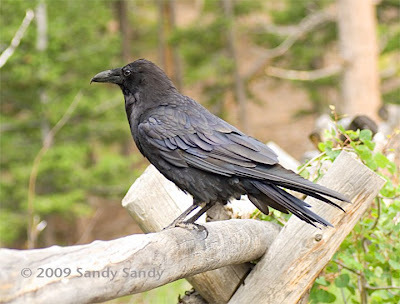 On my trip out to Colorado this month, crows and ravens seemed to follow me everywhere. 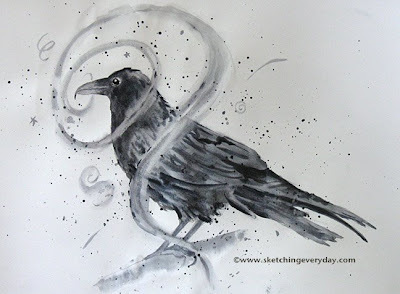 According to indigenous traditions, all species of crow, including raven, help us to realign our consciousness so we may better connect to the Great Mystery. 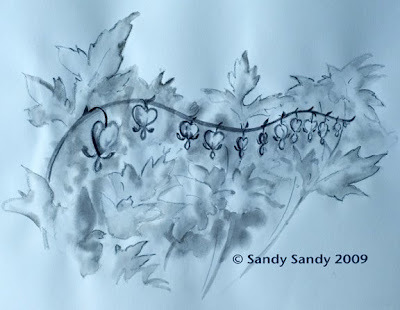 I have tried to portray this aspect in today's drawing. Check out my sister's great photos of our trip to CO here. 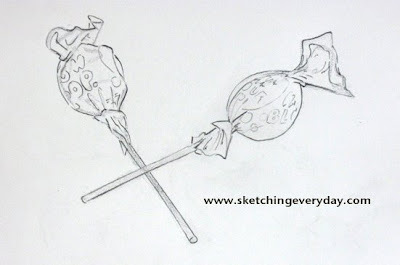 Today's quick sketch is of a couple of Blow Pops that just happened to be on my drawing table. This Blind Contour was done from another old (crude by today's standards) garden ornament that I inherited from my Aunt Milly. 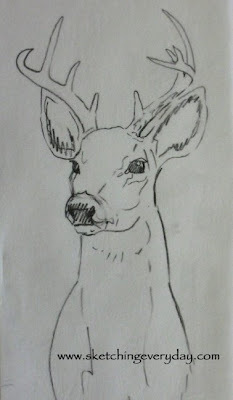 See the definition of Blind Contour in yesterday's post. 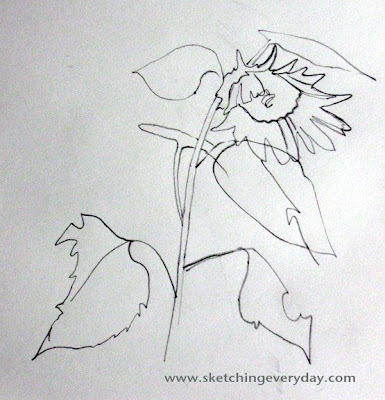 This is a "Blind Contour Drawing" of a sunflower that the birds planted by one of our bird feeders. 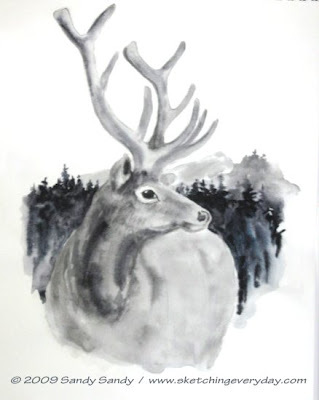 "Blind contour" is an excellent exercise which improves hand - eye coordination and really helps you to SEE. The idea is to refrain from looking down at your paper while you slowly draw your subject, caressing the object with your eyes. 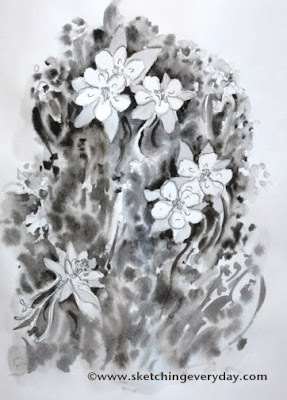 If you loose your way, you can look down and reposition your pencil if need be, but while drawing, you must not look at your paper, concentrating only on following the contours of the shape. The results will not be completely accurate, but often makes for some interesting studies. 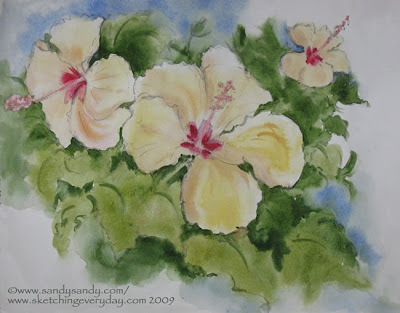 Here today is another floral sketch, utilizing the "Rule Of Thirds". Where the lines intersect are the best spots for a focal point. 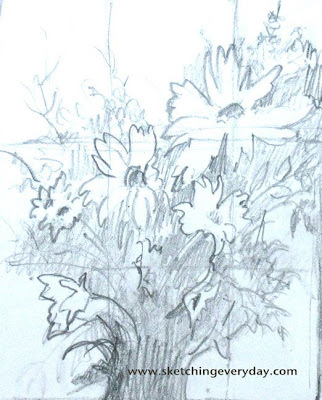 Today's sketch is a flower vignette. 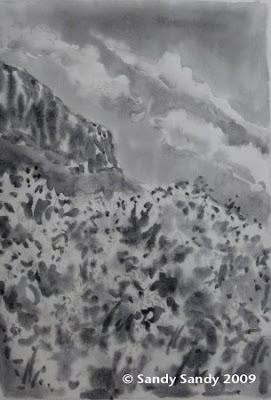 A vignette is a drawing or painting that involves a group of overlapping shapes placed somewhere on the paper, that is also surrounded by blank space. The image area should be a good shape. You must also take into consideration the sizes and shapes of the blank spaces, which should be varied. 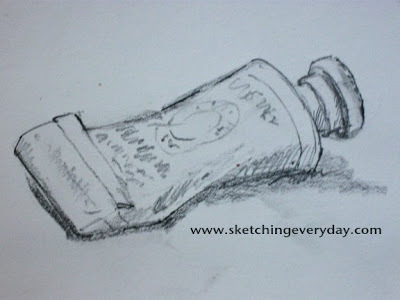 Today, I'm posting a quick sketch I just did of a tube of watercolor paint. Remember, everything is sketchable / paintable. 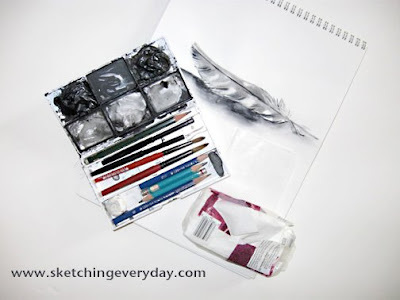 See Alla Prima Brushstroke Exercise by Larry Seiler of a tube of paint here. 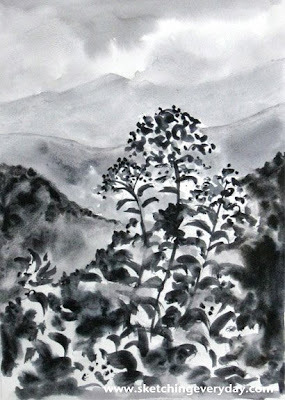 Keeping it simple, here's my interpretation of our last challenge photo from the Smoky Mountains. Today I'm also posting one of my photos from last week's trip to Colorado. Raven was with me everywhere I went on this trip. You can see here that this handsome fellow eagerly posed for me. 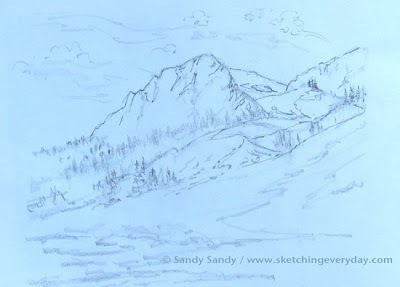 I'm posting yesterday's sketch (steps 1 + 2) tonight as well as today's finish on my Gothic Mountain drawing. It's good to be home, but I'm missing the mountains again already. 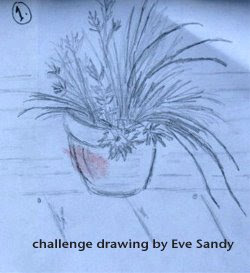 Look for the new challenge drawing tomorrow with my sketch of last week's photo. 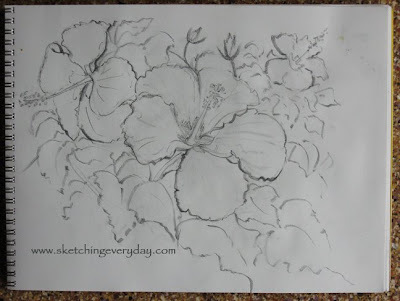 Here's another sketch done from photos of the flowers in Crested Butte. 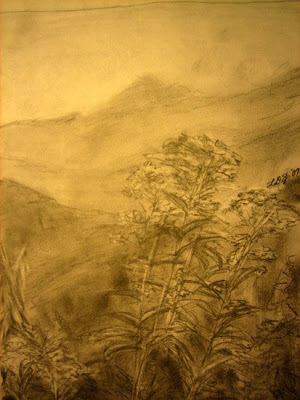 Also Laura DiFrancesco just sent in this lovely challenge sketch of the Smokey Mountains. Thanks Laura, great job! 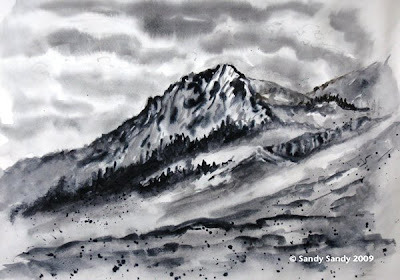 This sketch was inspired by a shot I took in Crested Butte yesterday. See pictures from Colorado on my web log. 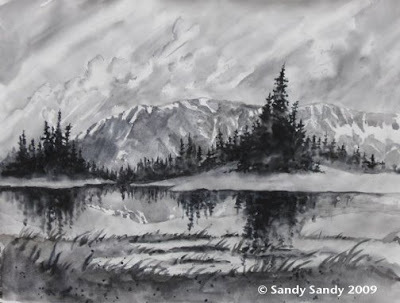 Just published - Read My Interview by Ralph Serpe On CREATIVE SPOTLIGHT's Art Instruction Blog. It's a beautiful morning here in Gunnison Colorado. The birds are very active. I've seen several Rufous hummers here. Jerry says our birds at home are doing well and he's busy filling our seven feeders 3 times a day! I'm sitting here in town at the Notchtop cafe with my dad. They've got free internet access and everything from coffee and danish to beer and sandwiches. We had an eventful day yesterday. 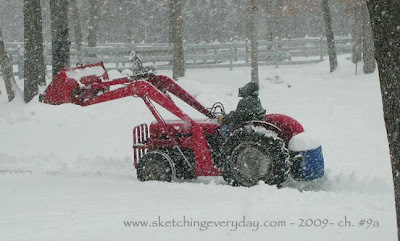 See more about our car trouble and photos from our day on my web log. Here's yesterday's drawing which I did on the plane from Philadelphia to Denver. 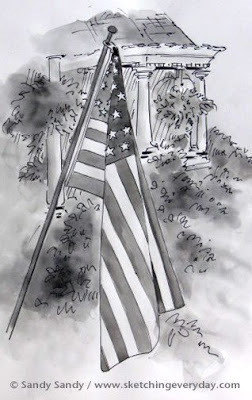 I couldn't get internet connection here yesterday, so this morning here is my 4th of July post. I'm here with my folks at Estes Park, Colorado. My mom showed me several of my drawing challenge sketches, but never sent them in, so here is my favorite from our 2nd challenge. 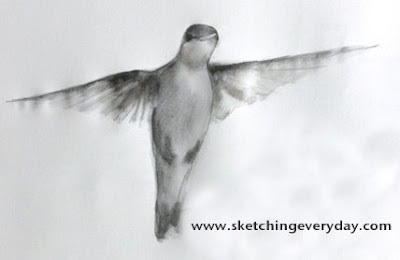 I was wondering what to draw tonight when Jerry came in with this gift left by the birdbath. 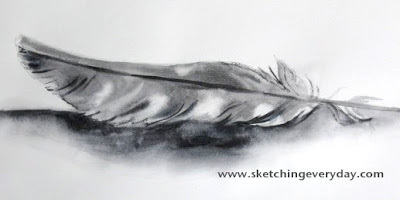 I believe it is a woodpecker feather; probably a Hairy or a Downy. I'm getting excited about my upcoming Colorado trip, so this bull elk was the perfect subject for me this afternoon. See the photo I drew from here.